SIR: We left Chattanooga on July 9 with the Texan Rangers, under Colonel Wharton, and the Second Georgia Cavalry, under Colonel Lawton. We made a forced march of nearly 50 miles, reaching Altamont on the night of the 10th instant. After resting one night we passed on to McMinnville, where I was joined on the night of the 11th by Colonel Morrison with a portion of the First Georgia Cavalry, two companies of Colonel Spiller’s battalion, under Major Smith, and two companies of Kentuckians, under Captains Taylor and Waltham. After this junction my whole force was about 1,400 men, and both men and horses were much jaded and worn by their long travel. After feeding and refreshing for a single day and being joined by some few volunteers I left on the 12th at 1 o’clock for Murfreesborough. It was over 50 miles to our destination, but there was no halt except for a short time to feed the men and horses. We approached Murfreesborough about 4.30 a.m. and fortunately captured the pickets of the enemy without firing a gun. I then learned that there were two regiments in and near Murfreesborough, one the Ninth Michigan and the other the Third Minnesota, 200 Pennsylvania cavalry, 100 of the Eighth Kentucky, and Captain Hewett’s battery of four guns, numbering in all 1,400 or 1,500 men, under the command of General Thomas Crittenden, of Indiana. There were said to be two camps, one in Murfreesborough of one infantry regiment and the cavalry, the other with the artillery about a mile distant, and a small force with the officers in the court-house and private houses around the public square. I decided immediately to attack the camp in town and the buildings, while the camp with the artillery should be held in check until the first was stormed and surrendered. Colonel Wharton with his Texan Rangers was ordered to charge the camp in town. He moved forward in gallant style at the head of his men, but owing to the urgent necessity of using a portion of the Rangers for the attack on the buildings he did not carry with him but two of his companies. This fact, however, did not abate his courage or that of his men. They charged over the tent ropes right into the camp. Colonel Wharton was soon severely wounded and the command of his Rangers devolved on Colonel Walker. Colonel Morrison with a portion of the Second’ Georgia was ordered to storm the court-house while the balance of the Texan Rangers were attacking the private buildings. After two or three hours’ hard struggle the court-house was fired and surrendered to Colonel Morrison. The private buildings were also cleared by the Rangers and General Crittenden and his staff surrendered. Lieut. Col. [Arthur] Hood, of the Second Georgia, with a portion of his force was ordered to storm the jail, which he did, releasing many prisoners confined for political offenses; he also took the telegraph office, capturing the operator. Colonel Lawton, with the First Georgia, the Tennesseeans and Kentuckians, was ordered to attack the second camp with the artillery, which he did with great efficiency for several hours. The Tennesseeans, under Major Smith, and Kentuckians, under Captains Taylor and. Waltham, stood the fire of shot and shell like veterans. The Georgians, under Captain Dunlop and Major Harper, made a gallant charge almost to the mouths of the cannon. After fighting them in front two or three hours I took immediate command of this force and charged the rear of the enemy into their camps and burned their camps and stores, demoralizing their force and weakening their strength. The force of Texan Rangers sent to attack the first camp was so small that, although they fought with desperate courage and great skill, they were gradually driven back. After the court-house and private buildings were surrendered and the fight had lasted five or six hours I prepared my whole force to storm both camps and summoned them to surrender. After some parley Colonel Duffield surrendered the infantry and artillery. My aide, Colonel Saunders, rendered me efficient aid until he was severely wounded by a ball from the court-house. Major Strange, my adjutant, also performed his whole duty. Lieutenant-Colonel Walker and Major Harrison, of the Rangers, acted with their usual daring and bravery. All the officers and men who acted bravely cannot be particularly mentioned, but they acted their part nobly. After the action was over I detached Major Smith to burn a railroad bridge below Murfreesborough, which he executed well. I intended to burn a railroad bridge above Murfreesborough and gave orders for the purpose, but by mistake they were not executed. I had the telegraph wire cut and a large portion of the railroad track torn up. I found four car-loads of provisions on the railroad track and the depot house full of stores, all of which I burned. There were between 1,100 and 1,200 privates and non-commissioned officers captured and brought to McMinnville and paroled on condition not to serve until exchanged. The officers have been already sent to Knoxville, in charge of Colonel Wharton (and I trust have safely reached their destination), except one or two who were wounded and left at Murfreesborough, on condition to surrender when restored to health. I captured four pieces of artillery–three brass pieces and one Parrott gun–which are still in my possession, With harness and ammunition. There were some 50 or 60 large road wagons with the mule teams, harness, &c., captured. I burnt some of the wagons, which could not be got away, and sent you the balance. There were a large number of cavalry horses, saddles, and small-arms, with the ammunition, captured, and such as I have not been compelled to use are also forwarded to you. In consequence of our being compelled to leave Murfreesborough, and not having received reports of the killed from some of my command, it is impossible to report accurately my loss. My best information is that we had about 25 killed and from 40 to 60 wounded. Among those killed is Lieutenant Green, of the Tennessee Battalion. The reports of the officers under my command when furnished will show more definitely the loss. The enemy lost about 75 killed and 125 wounded. The pecuniary loss to the enemy must be near half a million of dollars. Brigadier-General, Commanding Brigade of Cavalry. Adjutant-General, Army of East Tennessee. JULY 13, 1862.–Action at and surrender of Murfreesborough, Tenn.
No. 11.–Report of Maj. Gen. J.P. McCown, C. S. Army. CHATTANOOGA, TENN., July 17, 1862. Attacked Murfreesborough 5 a.m. last Sunday morning; captured two brigadier-generals, staff and field officers, and 1,200 men; burnt $200,000 worth of stores; captured sufficient stores with those burned to amount to $500,000, and brigade of 60 wagons, 300 mules, 150 or 200 horses, and field battery of four pieces; destroyed the railroad and depot at Murfreesborough. Had to retreat to McMinnville, owing to large number of prisoners to be guarded. Our loss 16 or 18 killed; 25 or 30 wounded. Enemy’s loss 200 or 300. Leaves to-day for re-enforcements coming from Kingston. No. 8.–Report of Lieut. Col. John G. Parkhurst, Ninth Michigan Infantry. This regiment, with the Third Regiment of Minnesota Infantry, Hewett’s Kentucky battery, and a portion of the Seventh Pennsylvania Cavalry, had been encamped in one encampment, in the city of Murfreesborough, for some months, under the command of Colonel Duffield, when, on May 9, he was assigned to command of the troops of Kentucky, and Colonel Lester, of the Third Minnesota, assumed command of the forces at Murfreesborough. On June 26 the force at Murfreesborough was divided and its strength greatly reduced by the Third Minnesota Regiment and Hewett’s battery being sent 1 ½ miles north of the city of Murfreesborough, on the Nashville pike, leaving the Ninth Michigan and a squadron of the Seventh Pennsylvania Cavalry occupying the old camping ground, and the only troops in the city. On June 30, agreeably to an order received from Colonel Lester, this force was further reduced, and Companies D, E, F, and I, of the Ninth Michigan, were sent to Tullahoma. Company B, Capt. [Oliver C.] Rounds, of the Ninth Michigan, was occupying the court-house, situated three-fourths of a mile from camp, and acting as provost guard for the city, leaving only five companies of my regiment in camp. From these companies heavy details for picket and other duties were constantly made, so that the force in camp was about 250 strong. The weakness of my camp and the divided condition of the forces at Murfreesborough were observed by General Crittenden upon his arrival and viewing of the camp on the 12th, and the danger to be apprehended in consequence of such division was remarked upon by both General Crittenden and Colonel Duffield, who returned to Murfreesborough in company with General Crittenden, and it was by them determined to reunite the forces at once. At 4 o’clock on the morning of the 13th I was aroused by the sentinel at my tent and informed that the enemy was advancing upon the camp. I at once turned out an gave the alarm in camp. The companies in camp turned out with alacrity, but before they had time to form square the enemy, mounted and some 1,200 strong, with terrific yells, dashed upon us from three directions, armed with double-barreled shot-guns and Colt’s navy revolvers. Some of my men gave way under this charge, but the majority of them stood firm and returned the first fire with great precision and fatal effect. After discharging their pieces the enemy retired and dismounted a part of his force and advanced upon us mounted and on foot. I rallied my force, and, although the effect of the fire of the enemy was terribly severe, my officers and men stood their ground with heroic courage and poured a destructive fire into the enemy’s ranks until he began to yield. Seeing this, I took advantage of it and ordered my force to advance and charge upon him. In obedience to this order my men, with a yell equal to that of the Texans, made a charge, driving the enemy before them until he was completely routed from my camp and driven out of and beyond reach of the camp of the Pennsylvania cavalry and brigade headquarters. I immediately ordered Company C; Capt. [Charles V.] De Land, to advance in pursuit, as skirmishers, as far as the second street in our front, which he did in good style, doing good execution and holding the line I had indicated to him and driving the enemy still farther in retreat. Finding an opportunity I immediately occupied my time in preparing for another attack, and marched my force into a garden in front of camp, which was inclosed by a cedar-post fence, and made use of such forage as I had in camp to barricade Maney avenue, which led to our right, and made use of the transportation wagons for a protection on our left, thus securing quite a formidable position. After having secured this position and learning that Colonel Lester had not advanced upon the enemy I dispatched a courier to Colonel Lester, informing him of the fight and of the superior force of the enemy and that Colonel Duffield was wounded and had left the field and that my loss had been very heavy, but that we were then in a good position and could make a successful defense if we could be re-enforce, and asked him to send re-enforcements. The enemy kept up a series of attacks and feints and he was as often repulsed. Not hearing from the courier, I dispatched a second courier with similar information as to our position and urged Colonel Lester to advance to our relief, informing him that we were receiving frequent attacks from a vastly superior force, but that we could hold out if he would re-enforce us. After some four hours’ time I received information that my couriers had been arrested by order of Colonel Lester as spies and that a courier from Colonel Lester had come over to ascertain our position. About 9.30 o’clock I sent by the courier who came from Colonel Lester a written statement of our position and requesting re-enforcements at once, knowing that if Colonel Lester would join us with his force we could drive the enemy from the city or capture his command. I received no reply from this dispatch nor from any that I sent to Colonel Lester, though he has since informed me that my couriers as well as my dispatch through his own courier reached him and that his courier had no trouble in returning to his camp. I leave Colonel Lester to account in his report or otherwise for his neglecting my repeated calls upon him for re-enforcements. The forces attacking my camp were the First Regiment Texas Rangers, Colonel Wharton, and a battalion of the First Georgia Rangers, Colonel Morrison, and a large number of citizens of Rutherford County, many of whom had recently taken the oath of allegiance to the United States Government. There were also quite a number of negroes attached to the Texas and Georgia troops, who were armed and equipped, and took part in the several engagements with my forces during the day. Simultaneously with the attack upon my camp Company B, Captain Rounds, was attacked at their quarters in the court-house by a large force of Georgia, Tennessee, and Kentucky cavalry. This company fought nobly and held their position for two and a half hours, killing and wounding a large number of the enemy’s forces, and until the enemy set fire to the lower part of the court-house, when they were compelled to surrender. COLONEL: I must demand an unconditional surrender of your force as prisoners of war or I will have every man put to the sword. You are aware of the overpowering force I have at my command, and this demand is made to prevent the effusion of blood. Brigadier-General of Cavalry, C. S. Army. This communication I forwarded to Colonel Duffield, who had been wounded in the first charge and removed from the field, asking for his order or advice in relation thereto. Colonel Duffield returned the communication with a message that he should leave the matter entirely to my discretion. Meantime I had ascertained that General Forrest had concentrated his entire force, save one squadron, which he had stationed on the Nashville pike, near the camp of the Minnesota regiment, in the immediate vicinity of my camp, hemming us in on all sides, and was preparing to make a charge upon us with his entire command, having surrounded us, and evidently intending, with this overwhelming force, to execute the threat contained in his demand for a surrender. Seeing our position, and concluding that I had nothing to hope for from Colonel Lester, having vainly looked for aid from him for seven hours, and ascertaining from actual count that I had but 134 men, including a few of Major Seibert’s Pennsylvania cavalry, who had retreated to our lines, I called a meeting of my officers to consider the demand for a surrender. The officers of the regiment, after considering our position, deemed it rashness to attempt to withstand the forces now brought against us, numbering over 1,800, and unanimously voted to surrender, and at 12 o’clock, eight hours after the commencement of the battle, I surrendered my command as prisoners of war. In the engagement I received a shot below the knee of my left leg, but no injury resulted from it. The loss of the enemy was very much greater than mine. Among their killed is Colonel Anderson, of one of the Georgia regiments, and among their wounded is Colonel Wharton, of the Texas Rangers. A large portion of their officers were either killed or wounded. I cannot speak in too high terms of the conduct of my officers and men, who, with only one exception, behaved nobly, fought like heroes, and conducted themselves like veteran soldiers; and where all behaved so well it would be invidious to attempt to discriminate. The exception I feel it my duty to mention. Capt. John A. Tanner, of Company K, at the first fire of the enemy retreated to the woods. This conduct needs no comment. Justice will overtake him. Subsequent to the surrender my command, including many of the wounded and sick from the hospital, were marched to McMinnville, some 40 miles from Murfreesborough, where the non-commissioned officers and privates were paroled. The commissioned officers were marched to Knoxville, Tenn., and sent thence to Madison, Ga., where we were confined in an old filthy cotton factory, which was alive with vermin and we were there compelled to provide ourselves with food, which was furnished, through the guard at the rate of $2 per diem per man. I beg leave to further report that, though assured that our private property would not be taken, everything not worn upon our backs was taken from us. Our trunks, which we were assured we could take with us, were broken open and the contents stolen or appropriated by greedy rebels. While on the march to Knoxville I was ordered to dismount and surrender my horse, which General Forrest instantly appropriated. Other officers were deprived of their horses. Lieut. Col, Ninth Regiment Michigan Infantry, Comdg. Acting Assistant Adjutant-General, Murfreesborough, Tenn.
No. 9.–Report of Col. Henry C. Lester, Third Minnesota Infantry. LIEUTENANT: I have the honor to report the share taken by my regiment in the action at Murfreesborough, Tenn, on Sunday, July 13, 1862. The attack was made about daylight upon the camp of the Ninth Michigan, the pickets having been captured without firing a shot. With the first alarm my regiment was formed in line and marched from camp toward town, for the purpose of effecting a junction with the other troops, the camping ground of the two regiments having been necessarily separated about 1 ½ miles in consequence of scarcity of water. We had proceeded nearly half a mile when the enemy appeared in force in the woods in our front, and also upon our left flank. Line of battle was at once formed upon the crest of a hill and we opened upon the enemy with shell. The firing was principally directed to the woods in front, where they were evidently forming for a charge. In the mean time a small force had made its way through a corn field on our left and attacked our camp, which, after a sharp skirmish with the camp guard they took, killing or capturing the guard and firing the tents. Some time was passed in shelling the woods, when a train arrived from Nashville, and was only stopped when it had reached a point opposite our position and distant from it about 100 yards. As soon as the enemy had seen the train pass they commenced to tear up the track between it and Nashville, and were repeatedly driven off by the artillery. A charge was made upon our left from the woods, but was easily repulsed, with some loss to the enemy. At this time a scout returned from the camp of the Ninth Michigan, reporting the enemy in strong three on the Lebanon road between the Michigan regiment and our position; and as the force in front seemed to be still too strong to attempt to push through with any prospect of success I determined to maintain my own position for the present. The firing in town having ceased for some time I sent a scout through the corn field to try and get news from our friends, but the effort was unsuccessful, the enemy being still in strong force on the Lebanon road. Shortly after a soldier of the Ninth Michigan came through and reported his regiment as having surrendered. Thereupon we fell back to a farm-house a short distance in our rear, which being surrounded by a fence I expected to make as strong as possible and to hold until the end. While taking up our new position a flag of truce appeared, borne by yourself, and sent at the request of Colonel Duffield, commanding Twenty-third Brigade, for the purpose of procuring an interview with me. I returned to town with the flag and had an interview with the colonel commanding, in which I learned that we were attacked by the rebel General Forrest with a brigade of cavalry. Learning from the Colonel that the enemy were in overwhelming force, and that even should the road be uninjured the forces at Nashville were absent upon an expedition and that there was no hope of re-enforcements, at his suggestion I agreed to refer the matter of surrender to my officers. Accordingly the matter was represented to them as derived from Colonel Duffield, and the great majority, looking upon further resistance as involving the certainty of an ultimate defeat with great loss, and with no possibility of an escape or assistance, it was decided to surrender, which was done at 3.30 p.m. The force surrendered by me consisted of about 450 infantry. The enemy’s force consisted of about 2,600 troops, together with some hundreds of citizens of the country between McMinnville and Murfreesborough, being in all about 3,000 men. I have the honor to be, very respectfully, your obedient servant. Acting Assistant Adjutant-General, Twenty-third Brigade. No. 2.–Report of Brig. Gen. T. T. Crittenden, U.S. Army, commanding at Murfreesborough. While at Athens, Ala., I received the special order of Major-General Buell assigning me to the command of the post of Murfreesborough, and went there as speedily as possible. I arrived there on the same train with Colonel Duffield, of the Ninth Michigan, on July 11. The next day I assumed command of the post and Colonel Duffield of the Twenty-third Brigade. Having no instructions, and knowing nothing of the affairs at the post, I had several interviews with Col. [Henry C.] Lester [Third Minnesota], then in command, and from his statements, made both to myself and Colonel Duffield, it was evident that he apprehended no danger. He stated that the only points from which the enemy could approach were McMinnville and Lebanon, that there was no force between Chattanooga and Murfreesborough, and that Morgan’s force was far beyond Lebanon, en route for Kentucky. Colonel Lester had separated his forces on or about June 23, 1862, leaving five companies of the Ninth Michigan and about 80 men of the Seventh Pennsylvania Cavalry at the old camp, and removing the Third Minnesota Regiment and Hewett’s First Kentucky Battery (four guns) about 1 ¼ miles northwest of the former camp. This was the whole force there on July 13, except one company Ninth Michigan posted in the court-house as provost-guard, altogether numbering about 950 effective men. I appointed Lieut. [Henry M.] Duffield, Ninth Michigan, acting assistant adjutant-general, Lieut. C. H. Blakey, who had been previously acting, having left for Minnesota on recruiting service on July 12. Lieutenant Duffield, under my orders, proceeded at once to prepare a morning report, but did not complete it that day. I then went with Colonel Duffield to look for a proper camp for the whole force, as I would not permit it to remain separated. I found the water, the scarcity of which Colonel Lester assigned as the reason for such division, abundant to supply 5,000 men and a good camp ground within a quarter of a mile of the former camp. I examined other camp sites, but preferred the first, and ordered Colonel Duffield to concentrate his force there. The same day I rode out with the officer of the day and made an examination of the pickets. Being dissatisfied with its strength and locations, I directed Major Seibert, commanding the cavalry, to double his cavalry force on all the roads to Lebanon and McMinnville, which he did, but withdrew them at night, in accordance with the custom and orders of Colonel Lester under which he had previously acted, of which custom and order I was entirely ignorant. There was no such order on the order-book, it being merely verbal. I had doubled the cavalry on the points of danger, as a temporary strengthening of the pickets, until next day, when I had ordered a much larger detail for picket duty from the infantry. My temporary headquarters were opposite to and about 75 yards from the court-house. I have been informed that Colonel Lester had some intelligence of a cavalry force of the enemy assembling near McMinnville, but he did not inform me nor did I have any information of impending danger. I found things negligently and loosely done at the post and attempted to remedy all the negligence I saw there. At daylight of July 13 General Forrest, with 2,500 cavalry, consisting of four regiments and one battalion–among them the First and Second Georgia and Seventh Texas, having marched 48 miles between noon of the 12th and that time–surrounded and captured the pickets on one of the roads to McMinnville without the firing of a gun, rushed at full speed into the camp of the Seventh Pennsylvania Cavalry and into the court-house square and streets of the town. Passing through the cavalry camp they attacked the Ninth Michigan, which was ready to receive them. Severe fighting at this point resulted in driving the enemy back some 300 yards after repeated assaults, both sides losing heavily. Colonel Duffield, commanding Twenty-third Brigade, was severely wounded early in the action and carried from the field. He was paroled at once, and I have had no report from him. Lieutenant-Colonel Parkhurst, commanding the Ninth Michigan, after holding his camp nearly eight hours against superior numbers, finding the enemy were surrounding him with their whole force and having no hope of re-enforcement (not receiving any reply to several messages for assistance sent by him to Colonel Lester), surrendered his force, then reduced to 134 men. This fragment of a regiment, under its gallant lieutenant-colonel (Parkhurst), fought splendidly, and deserves honorable mention. Their loss was 11 killed, 86 wounded, and 36 missing. Company B, Ninth Michigan, the provost guard, made a resolute defense of the court house for three hours during repeated assaults, killing 12 and wounding 18 of the enemy. They did not surrender until the court-house was set on fire. During these hours of suspense only an occasional shot was heard from the Third Minnesota and Hewett’s battery. Of course their comparative quiet showed that they were not attacked in three. From the reports of Colonel Lester and Captain Hewett and from other sources I learned that their commands turned out promptly, marched unattacked nearly half a mile, and were there halted by Colonel Lester. Except slight changes of position, they remained there from 4.30 a.m. until 2.30 p.m., twice or three times menaced by small squads and once attacked by about 300 cavalry. The latter were repulsed by the fire of the skirmishers and one volley from two companies on the left flank of the regiment. Within three-quarters of a mile of their position they heard the fighting at the court-house for three hours and during seven hours and a half’ the fight at the Michigan camp. The Third Minnesota was a splendidly drilled regiment. The officers and men were anxious to fight, but Colonel Lester held them there without seeing any enemy in force. Colonel Lester received two dispatches from Lieutenant-Colonel Parkhurst, begging for aid, but would afford none. When all was lost except his own command Colonel Lester went under a flag of truce to see Colonel Duffield, and there saw the enemy, who had not dared to come within range of his artillery, and was so impressed with what he saw that he returned, determined to surrender. This is proved by his calling a council of his company commanders and his lieutenant-colonel [Chauncey W. Griggs]. They, by a viva-voce vote, decided to fight. Part of them went from the council. Colonel Lester reopened and reargued the matter. A ballot vote was taken and the force was surrendered. This was done by the statements and influence of Colonel Lester. Lieutenant-Colonel Griggs bitterly opposed the surrender and voted against it to the last. Not a man was killed in the line of the Third Minnesota during the day. I state the facts without comment. With a few men I held my headquarters until after the court-house was taken. I early sent a messenger, in citizen’s clothes, with orders to Colonel Duffield, but he could not pass through the enemy’s lines. They had my quarters surrounded from the time they entered the square. I submit copies of reports made to me and refer to them. I respectfully demand a court of inquiry into the disaster at Murfreesborough. Assistant Adjutant-General and Chief of Staff. Nashville, Tenn., November 26, 1862. Respectfully forwarded to the Adjutant-General of the Army, with the request that this case may receive prompt attention and that Colonel Lester be ignominiously dismissed the service. (*) As Capt. [John A.] Tanner is under my command, I propose to avail myself of the authority delegated to me by the Secretary of War and shall dismiss him. (+) General Crittenden I will order to duty. Major-General, U.S. Volunteers, Comdg. Department. Operations in Kentucky, Middle and East Tennessee, North Alabama, and Southwest Virginia.–June 10-October 31, 1862. No. 2.–Findings of “Buell Commission” and accompanying documents. Morgan had not yet disappeared from Kentucky, after his first inroad, when Forrest, with a large force, suddenly appeared at Murfreesborough on the 13th of July, surprised and captured the garrison, consisting of some 1,400 men–cavalry, artillery, and infantry–forming part of the force which was about to march from that place and Tullahoma to occupy McMinnville, and did serious damage to the railroad. Two other regiments which had been designed as a permanent garrison for Murfreesborough had been detached and sent into Kentucky on the occasion of Morgan’s incursion. The consequence of this disaster was serious. The use of the railroad from Nashville, which had been completed the very day before and which I was depending on to throw supplies into Stevenson for a forward movement, was set back two weeks; the force of Forrest threatened Nashville itself and the whole line of railroad through Tennessee, and the occupation of McMinnville was delayed two weeks. It became necessary to move northward some of the troops in North Alabama to drive out the rebel force and guard against further embarrassment. Nelson’s division was ordered by rapid marches to Murfreesborough, one brigade going by railroad through Nashville; two brigades of Wood’s division were ordered from Decatur to Shelbyville by forced marches and subsequently to Decherd, to give greater security to Elk River Bridge and guard the important route from the mountains into North Alabama through Winchester. A little later the remaining brigade of Wood’s division was ordered to Stevenson to erect defensive works for the depot which was to be established at that point for the movement against Chattanooga. 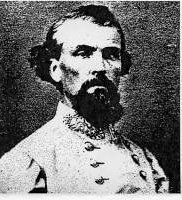 The excitement caused by Morgan’s raid into Kentucky had been so great and the call for troops so urgent that I apprehended I should be compelled to send a division there; but to do that was to put an advance into East Tennessee out of the question, and I determined to trust Kentucky to the few troops already there rather than abandon the object for which I had started.